Nov/Dec 2018: Posters! 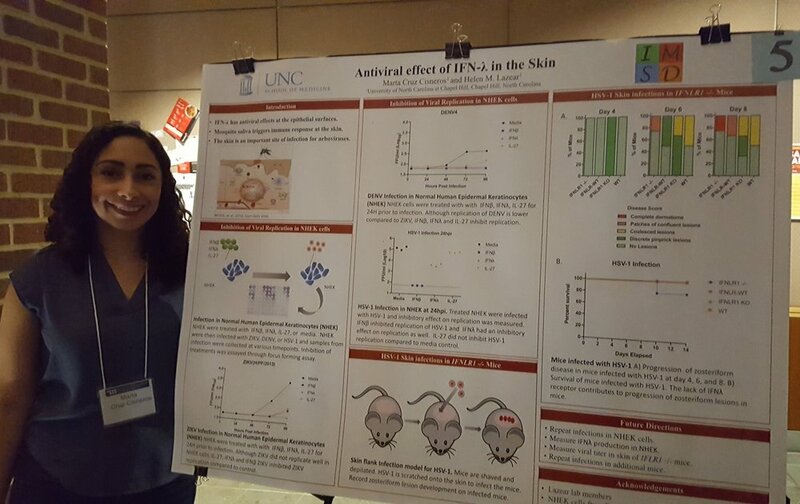 BBSP graduate student Marta Cruz Cisneros presented her rotation project on the role of IFN-lambda in antiviral immunity in skin. Undergraduate researcher Leah Gilmore presented her BIOL395 project on developing tools to study vertebrate-specific flaviviruses. Nov 2018: Happy 3rd birthday, Lazear Lab! It’s going to be a great year ahead. 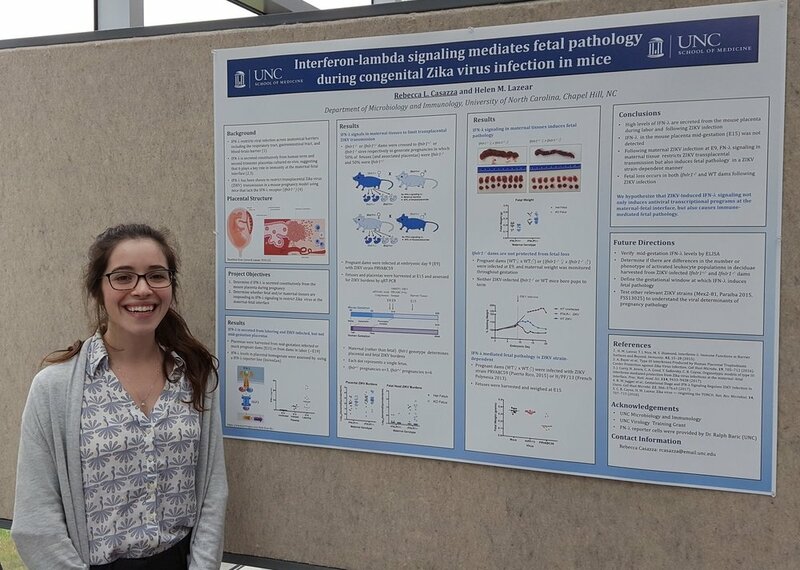 In a busy week, Becca presented her poster at the NIH IFN-lambda meeting, passed her qualifying exam, and gave her first Virology in Progress seminar. We’re proud to have her as the newest PhD candidate in our lab! 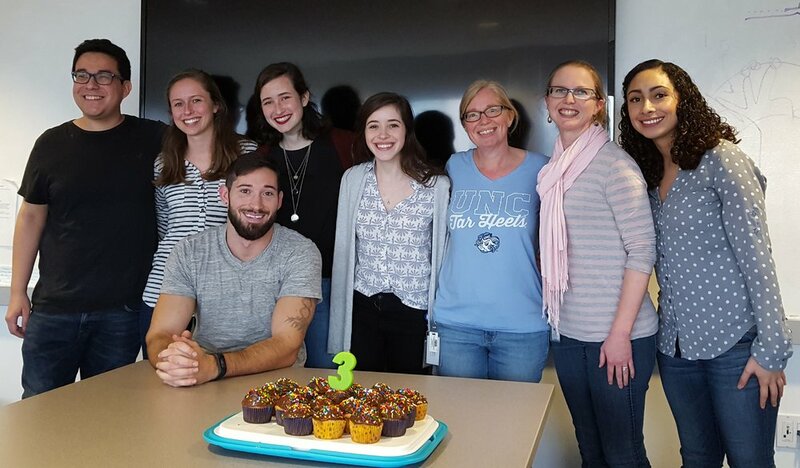 July 2018: So long to UNC undergrads Tesia and Claire from the SMART Program. Tesia worked with Cesar to evaluate ZIKV antibody responses to understand the immune mechanisms that protect against ZIKV sexual transmission. Claire worked with Derek to generate isogenic ZIKV mutants representing variants found in different isolate strains to assess their replication in cell culture and virulence in mice. Derek Carbaugh "Envelope Protein Glycosylation Mediates Zika Virus Infection In Vivo"
Becca Cassazza "The Antiviral Effects of Interferon Lambda at the Maternal-Fetal Interface"
Cesar Lopez "Transplacental IgG Transfer Is Maintained During Maternal Zika Virus Infection"
Clayton Morrison "Zika Virus Inhibits Toll Pathway Signaling in Mosquito Cells"
May 2018: Welcome to UNC undergrads Claire and Tesia from the SMART program and to Clayton, a visiting scientist from the University of Mount Olive. April 2018: Congrats to Cesar for receiving a Benjamin H. Kean Travel Fellowship in Tropical Medicine! He will spend one month at UNAN-Leon, Nicaragua studying antibody-mediated protection from Zika virus sexual transmission. Thanks to the American Society of Tropical Medicine and Hygiene for supporting Cesar's research.